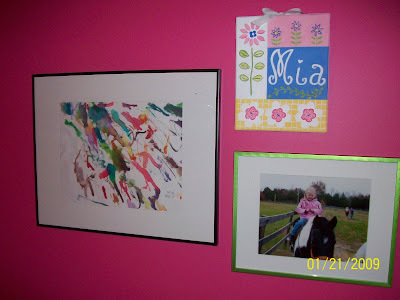 Today I am giving a little tour of Mia's bedroom. so I decided to let everyone get a peek into ours. I am pretty nosy by nature. I am INTERESTED in others' lives by nature. 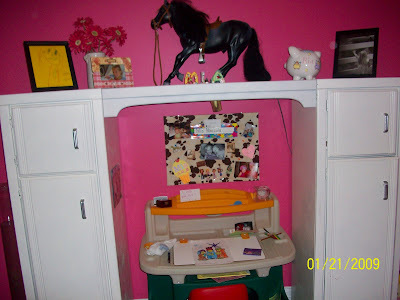 If you are also, you will enjoy the tour of Mia's Horse Room! 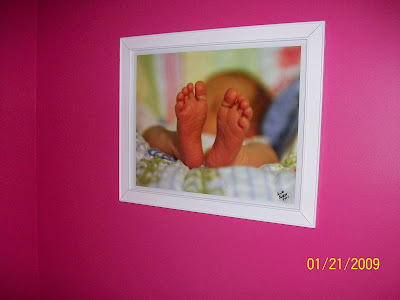 (You may need some sunglasses, as the HOT PINK walls are bright. 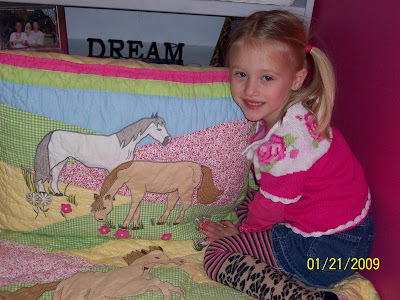 Mia's cute NEW Horse Quilt and Sham. I got it on BIDTOPIA.COM for $4.25. 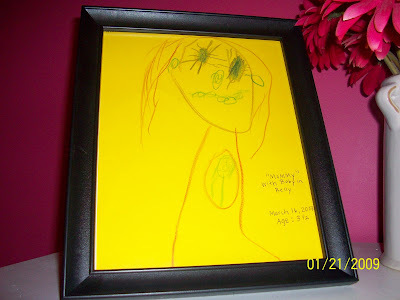 I had to frame this picture Mia drew of me! It is me with Gracie in my belly. I LOVE the baby so much. And check out my teeth! be able to see everyday. 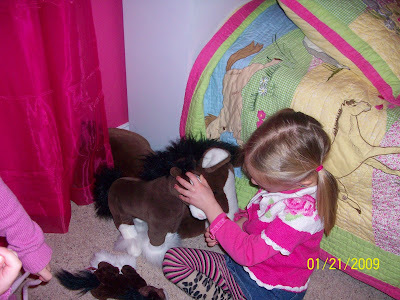 Mia hanging with one of her 50 horses. She was only about 3 weeks or so when this was taken. I am NOT a decorator so if anyone has a better plan let me know. Wasn't quite sure how to fit all three?! One is her painting that she die when she was three. Also, a picture of her riding a beloved horse. Steve's baseball players made us. 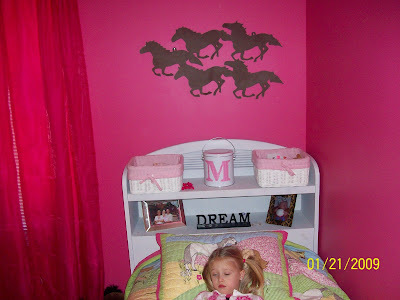 Now, her most FAV item in her room, her RUNNING HORSES. I put her desk under the dresser where her bed is supposed to go to save some space. I covered a pin board in Horse Print fabric and she went crazy over it! She loves to pin random things up there that she saves. And she saves a lot of random things these days. 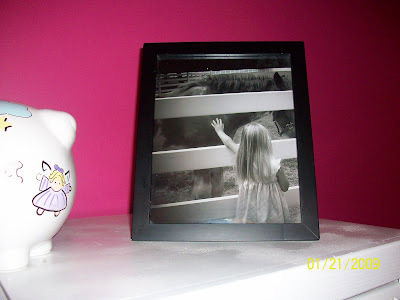 And finally, one of my favorite pictures of her reaching through a fence to pet a horse. ready to go, Mia decided to try to do some front rolls. and could only look one way the entire day! But luckily this guy cheered her up! She says she is going to be a VET-RA-NARIN when she grows up. This is what I always said I wanted to be (see she really is my clone!) so I would love to see her make her dream come true! Thanks for stopping by for a little Horse Bedroom Tour!